My special guest today is author Taylor Hobbs and we’re talking about her new historical fantasy romance, Cloaked. During her virtual book tour, Taylor will be awarding a $25 Amazon or Barnes and Noble (winner’s choice) gift card to a lucky randomly drawn winner. To be entered for a chance to win, use the form below. To increase your chances of winning, feel free to visit her other tour stops and enter there, too! Taylor Hobbs lives aboard a 38 ft sailboat named Story Time with her husband, baby girl, and dog. They are a military family and who love to travel, whether it is by sea or air. When she's not writing, Taylor enjoys doing yoga and planning her next adventure. Welcome, Taylor. Please share a little bit about your current release. Now hunted throughout the land, Fawkes must face long-buried secrets in order to survive, but they could destroy him. Charlotte risks everything, including her heart, to set Fawkes on the path to redemption. Will Charlotte have the strength to pull Fawkes into the light, or will she follow him into the shadows? This story poured out of me, and I wrote 80,000 words in 80 days. I was going through a difficult time in my life, so I needed a sweeping fantasy novel to escape into and a kickass female protagonist to encourage me. The opening line came out of nowhere, and I couldn’t stop thinking about it until I wrote it down. I built the story from there. For those wondering, this is the opening line: ‘Naked as the day she was born, Charlotte felt the earth’s grip tighten around her with an unyielding hold.’ It was a visceral, no-holds-barred way to introduce her. It’s about an American woman who buys a village in Spain. I based it off an article I read in 2015 about the Spanish government putting abandoned properties and villages up for sale after their economy crashed. It has a healthy dose of magical realism and an unreliable narrator. Under the Tuscan Sun meets Rebecca. Probably when I finished my first manuscript. It was terrible, but there was such satisfaction in seeing a story through to the end. Cloaked is my third novel, but first to be published. I’ve felt like a writer for a long time, but now I get to call myself an author, which is a strange feeling. I don’t fully consider myself to be one yet. I am a military spouse and mom to an 8-month-old. Let’s just say my writing productivity has definitely nosedived in the past, oh, 8 months or so. I used to write full time, but now I squeeze it in during naptimes, after dinner, and on the weekends. I always draft single-spaced until I type ‘The End.’ Then I double space the manuscript and watch it get so much longer! It’s my weird little reward for finishing it. An Olympic gymnast. By the time I was twelve, I was a level 8 gymnast who practiced 4 hours a day, 5 days a week after school. I ended up getting burned out and said goodbye to my Olympic dream, but started coaching in high school instead! Being a writer never crossed my mind. I loved to read, but didn’t start writing until after college. I live aboard a 38 ft sailboat named Story Time with my husband, baby girl, and dog. When I’m not writing, I enjoy doing yoga and planning our next adventure. Detective and film noir writer Harold Martin Howington (H.M. Howington) is here today to chat a little bit about his new suspense drama, The Redhead. Welcome, Harold. Please tell us a little bit about yourself. Hi, my name is Harold Martin Howington, but everyone calls me Marty. I was born on March 24, 1944, in Abbs Valley, Virginia. My family moved from there to Ohio, and we stayed there for several years. My first wife was killed in an auto accident in 1969. I served in the US Army from October 1966 to October 1968. From March 1967 to March 1968, I served in Vietnam, where I was decorated for valor, which I won’t go into now. Through the years, I worked as a musician playing guitar and piano in a road band. I’ve done studio recording and played for other artists in these sessions. I drove a big truck and covered all fifty states, Alaska and Hawaii was by Uncle Sam during the Vietnam War. We stopped in Alaska going over and stopped in Hawaii coming home. I have been in all fifty states. I finally wound up in Florida, where I still live with my wife of thirty-four years. I also performed in our local theater as many different characters in several plays. I did sound and lighting for some plays. Charlie McQuillen is an ex-military intelligence officer who served during World War II. After serving his country above and beyond the call of duty, he retired from the US Army and settled down in Los Angeles, California. He got a job as a police investigator and worked at that until he decided he would try working as a private investigator. His first case kind of fell on him out of sheer luck. So this set him on his way. While reading a book about World War II called Other Losses, I found something very interesting and I thought I should write a story with this information, so I did. Her red hair draped down over her shoulders just below her grapefruit sized breast. I couldn't help think that this girl could be dangerous in a lot of ways. Deep inside something told me not to trust her, but still I wanted to know what was on her mind. You could get into trouble sometimes. I was hoping it wouldn't be this time. My next story is about a guy found dead in an alley and no one seems to know who he is. When my book won some awards, including the da Vinci Eye at the 2018 Eric Hoffer Book Awards and “Best Drama” in a contest by Pacific Book Review. I’m retired now so I write as much as I can. I don’t consider myself a full-time writer because of poor vision. I write comedy plays and I find myself laughing at the stuff I write. I wanted to be a cowboy, and drive big trucks. I wanted to write and play music also. I would like to thank everyone who buys my book and I would love to meet every one and sign their book. Thanks for stopping by today, Marty! I’m welcoming back Bentley Wells today with a new focus – his short story collection, The Question and Other Stories. His June 2017 interview about The Paradise Coven is here. Bentley Wells has written a few short stories that have been published in literary magazines and The Paradise Coven, a mystery that was published by Black Opal Books in 2017. 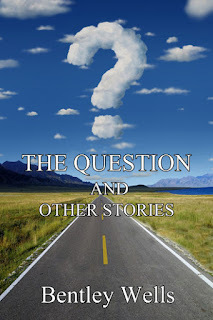 The Question and Other Stories is published by Black Opal Books as well. Welcome back, Bentley. What do you enjoy most about writing short stories? I believe it is the attempt to depict authentic characters in a realistic situation or situations in fewer words than typically found in a novelette or novel. Of course, an author doesn’t necessarily include as many characters or situations in a short story as in a novelette or novel. Still, a short story―like a novelette or novel―should have a logical conclusion. The title story, which was published in a literary magazine before it was revised and published in this collection, is a slice of life and depicts a young man in college who has seen the campus queen and wonders what it is like to date someone like her. He expresses as much to his roommates who are playing cards. They tease him about asking her out on a date, which he does, and she accepts. Another story, which is longer, concerns a veteran of Vietnam who encourages a young woman enrolled in college to leave campus to go with him across the country. The young woman doesn’t realize the veteran will do almost anything to get attention until it is too late. Another story concerns a president of a small town bank who enjoys reading ads in a local publication’s personals column. Although he has never responded to any of the ads, he decides to respond to one that has caught his attention. A week or two later the woman responds. He responds. With each letter, the two learn about the other. Eventually, she agrees to meet him by having him come to her home. She has cooked a wonderful dinner. However, as the evening passes, he realizes the woman is not like his late wife. The woman realizes that he is not the man for her. My first novel―The Paradise Coven―was a mystery. This book is a collection of short stories. Only two or three of the stories are mysteries, however. Other stories in the collection are examples of romance, humor, etc. I am working on another mystery, but it doesn’t feature the same detectives as the first. So, to make a long story short, I would say that I enjoy writing mysteries or suspense. I suppose I enjoy writing in this genre because I enjoy reading mysteries and suspense by other writers. Mysteries allow authors to pit bad people against good people. Mysteries also allow authors to provide justice to those characters who deserve it. And this justice can be swift or drawn out. I am writing a mystery set in a fictitious town in Oklahoma. After earning a graduate degree in business, Frank Williams returns home in time to attend his father’s funeral. James Williams was a successful businessman and pillar of the community. He was revered by those who knew him, but someone killed him. The authorities have few clues and no suspects. Frank investigates. Eventually, he uncovers evidence that leads to the governor’s office. Unfortunately, the evidence also reveals his father’s unscrupulous activities. If the evidence is presented during the trial, Frank realizes his father’s reputation will be tarnished. Yet, he can’t allow those responsible to remain free―can he? I do most of my research on my computer. For instance, if I’m looking for publishers of mysteries, I will type “publishers of mysteries” or something to this effect. In addition, I will consult Writer’s Market and/or Literary Marketplace. I don’t believe I have any interesting writing quirks. At least, I can’t think of any. That was many years ago. However, I know I wanted to write―or have a career that included some writing―when I was in high school. I believe readers will enjoy The Question and Other Stories. Thanks for chatting with me today! 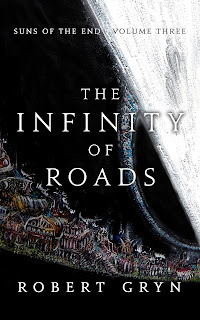 Author Robert Gryn is in the hot seat today and we’re talking about his new sci-fi fantasy, The Infinity of Roads – Suns of the End Volume Three. Robert Gryn was born in Poland during the latter years of the communist regime. His parents recognized that the socialist experiment was doomed to fail and set out for the more hopeful shores of America. Robert spent his youth moving from one school to another, winding up in one of the worst high schools in New Jersey. After graduating, Robert spent years working odd jobs in warehouses and construction sites. Like his parents before him, Robert soon realized that the personal experiment of his own life was doomed to fail. Determined to find a better path, Robert decided to attend Columbia University where he studied everything from Psychology to Japanese, as well as Creative Writing. Unfortunately, even graduating with highest honors didn’t put him on a path that spoke to him. He drifted again, and accidentally wound up becoming a successful technology consultant, primarily because he knew how to turn on a computer. sunlight and the pristine beaches he sat down to begin writing the books that had always been in the back of his mind. He soon found that he was not so much a writer but a chronicler, as if the words had drifted into his mind from all those future centuries. What could he do but tell the stories of all those people who may never exist? Robert has written a number of novels of impossible futures and unbelievable dreams. And as long as he knows how to turn on a computer, or commune with the thinking machines of tomorrow, he will continue to do so. Welcome, Robert. Please tell us about your current release. 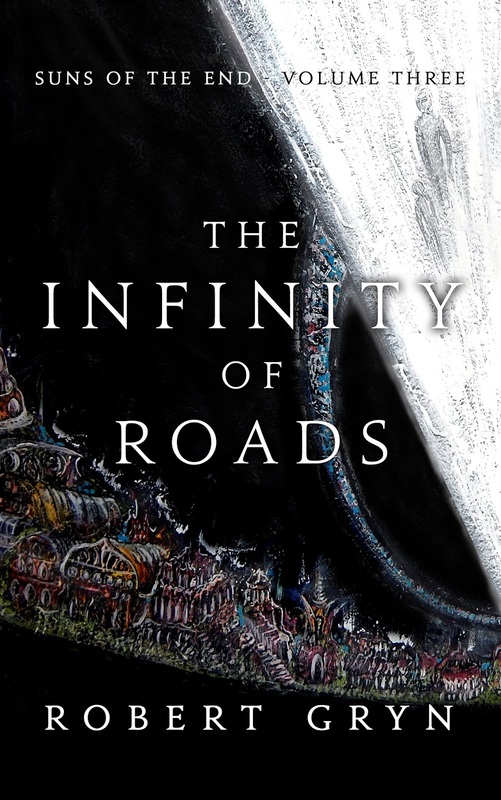 The Infinity of Roads is the third volume in the Suns of The End series. The series is set at the end of the universe. All but a few stars have gone out or have been extinguished in stellar wars between beings that blur the line between machines and gods. The story centers around a number of characters, most of whom are just trying to survive the wars that continue to rage between the children of the gods. In a higher layer of the cosmos, the hero Solaz deals with becoming more machine than man as he searches for a way to save a dying world made of light. On the crumbling world of the Shell, Deya, the last general of one of the immortals, struggles for survival in a frozen wasteland. Around the shadowed covered world of Uin, the twin immortal sisters Namtilak and Asuruludu continue their war to decide who will rule the Kingdom of All. The newly knighted Rider Haspar pilots her great armor through the void in the conflict between the divine sisters. Meanwhile, Darsen, the former ruler of the Kingdom of All, searches for his own origins across the fabled Seven Worlds. And somewhere amid the dreams and sentient formulas of forgotten machines, a spirit is reborn. The Suns of the End series was inspired by the Hindu epic poem The Mahabharata. While my story is not a straightforward retelling, I drew on the themes and characters from the poem. I also tried to incorporate ideas and concepts from the whole of sci-fi and fantasy. As the story is set at the end of the universe, everything has happened and so pretty much anything is fair game to appear. This series is also something of an experiment in writing for me. In my other novels, I take a more strategic view to storytelling, but in the Suns of the End I write down ideas as they come into my mind and try to reconcile them into a cohesive story. The first volume, Fields of Rust, was originally drafted almost entirely by instinct. I like to say that I’m not so much a writer but a chronicler of stories told to me from the far future. Darsen smiled. Every time he forgot that he had grown so young again, someone reminded him, to his surprise. He made a show of checking the diving suit he had bought for this expedition. It was more like a lesser armor worn by the warriors of the Seven Worlds than an outfit for sport. Only its gaudy colors and unnecessary embellishments made it something unsuited for combat. Even its aura was colored for aesthetics, glowing with colors matching different parts of the suit. On the back of the suit, four gravity wings shimmered in the air. An ornate far-rifle was slung in three pieces on his thighs. How unnecessary it all seemed. Darsen could have dove into the overgrowth naked. But in maintaining the pretense of normalcy, he had learned a fair bit in the last few days about the wants and thoughts of people he would have never met in court. Most of those he encountered were content in their small personal worlds. They wished for enough coin to eat and drink their fill. Many simply wished to be entertained, whether by crude theatre or the sporting events in which Darsen had proved so capable. That a war now raged between two of the Vedalan on some small, little-known world seldom entered the conversation. The bosun gave him the all clear, and Darsen dove off the side of the yacht. He had a glimpse of its long sleek shape and then all he saw was the tall antennas and stacks that emerged from the convoluted mass below. He could not tell where one factory ended and another began. Signs of power, smoke, and motion indicated that the factories on the surface were still alive. Darsen let himself fall among the gaps in their architecture. In the higher layers, he did not have to use his gravity wings, simply turning his body to fall between the wide gaps in the structures. However, his path soon became filled with bridges, pipes, and assembly lines. He now used the wings sparingly, still falling, turning when necessary. Predatory drones watched him and a few even gave chase, their engines flaring plasma as their hungry talons extended from their manipulators. Darsen saw more and more machine fauna as he fell. Great forge beasts with smoking bellies, multi-legged cattle running in great vertical herds, clouds of mechanized insects whose formations were meaningful symbols or forgotten mandalas. The path through the factories grew dark, and Darsen realized that he had fallen to a section where ancient behemoths breathed their last until there was no motion, no mechanical life. He alighted on the ground here, where there was nowhere else to fall. Whether this was the actual ground or the vast roof of some lower factory was unclear. He stood in a cavernous chamber strewn with broken engines and quiet machines. What purpose this place had served or what it had manufactured, he could not immediately tell. The only light fell in distinct shafts from broken sections of the ceiling. Some of these beams had the soft color of Brass’s orange sky, while most were the green of generators and plasma fires that still burned high above. Darsen looked up through the coral-like formation of the factories. He could no longer see the yacht from which he had made his leap. Were he a mundane man, he might have experienced fear at this moment. The way back, if he could find it, would be difficult if not impossible. He was surrounded by dead machines and a growing dread at the edge of awareness that the stillness was not true death but the expectant silence before the ambush. I have several projects in the works currently. I recently completed a novel about a two-sided city where all realities and people meet called Two Skies Before Night. The people who come to dwell in this city are all inadvertent refugees. The city allows them to understand each and anything written but the price is that they can’t write anything, not even graffiti. The story follows a detective who is trying to solve a double murder which takes him from the poor neighborhoods of Below to the homes of the rich and powerful of Above. I’m currently working on a final draft of an epic fantasy tale set in a universe where Lovecraftian gods have ruled over an empire of worlds for millennia. The story focuses on a warrior who is betrayed and finds herself with nothing left but revenge. As she journeys through the normalized dystopias of several different worlds, the fairy tale that was her life slowly falls away and she comes to realize that reality is something harsh and capricious. I remember telling my friends in high school that I was going to be a writer. But it took me years to sit down and actually start writing. Once I did, I found that I had a lot of stories to finish. I suppose a good deal of my need to write comes from all the sci-fi/fantasy novels, films, and shows I’ve read or seen over the course of my life. You can only fill your head with so much before it comes spilling out. After working for some years as a consultant, I’ve been lucky enough to work on my writing full time for the last few years. As a non-morning person, I usually work on non-creative stuff before lunch and then dive into actual writing after lunch. I’ve also had good success writing in the evenings, especially when my supply of coffee doesn’t run low. But I tend to get some of my best ideas while jogging or doing martial arts. Something about raising your metabolism gets those sci-fi synapses firing. As for things other than writing, I confess I’m a bit of an escapist. I’m always happiest dwelling in another world, whether that’s books, films, TV shows, video games, or just daydreams. I didn’t really know how to answer this question so I started looking up what exactly is a quirk. Is it some kind of little-known subatomic particle or just another way to flag something that doesn’t fit into our definition of normal expected behavior? And maybe this is my quirk, that when I’m writing I take a reductionist view of many things, trying to understand where they come from before including them in my stories. I suppose it’s hard for me to take anything for granted. A Shaolin monk, then Doctor Who, then a samurai, and back around again. Book: One of my favorite hard sci-fi novels that feels almost too realistic (in a scary way). And one of the few books I’ve actually read more than once. Graphic Novel: Hayao Miyazaki’s epic tale of war after an ecological apocalypse can change the way one looks at comic books or their Japanese equivalent, manga. Film: Seeing this performance was what originally inspired me to study and write about the Mahabharata. Music: I listen to My Sleeping Karma a great deal while writing.